The beautiful state of Maine holds the ancient aquifers responsible for Poland Spring® Brand Natural Spring Water’s distinctive taste. Created by a retreating glacier 20,000 years ago, these aquifers are some of nature’s best purification systems. Continuously fed by water from rainfall and melting snow, the water percolates through layers of fine sand and gravel to produce spring water with a clean, crisp, refreshing taste. 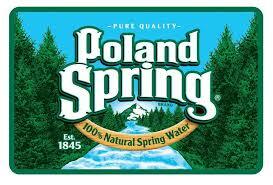 Poland Spring® Brand Natural Spring Water is naturally salt-free.